It's different between iTunes video and common video formats like MP4, MOV, FLV, WMV, etc. As we all know, we can play the common videos on different portable players without authorized account. But for iTunes video, it can't work. What's the reason? Yes, it's caused by the DRM protection. All downloaded iTunes videos are encrypted by DRM protection. You are only allowed to play them on the Apple devices with authorization. It is not convenient to enjoy the iTunes Media on other players. How can we remove the DRM protection from iTunes media files? A wonderful iTunes DRM Media Converter - M4VConverter Plus can help you. M4VConverter Plus is a professional and wonderful iTunes DRM converter. It is able to remove DRM protection from iTunes video with ease, and convert M4V to all popular video formats such as MP4, MOV, AVI, 3GP, WMV, FLV and so on. You can also extract audio from M4V to MP3, AAC, M4A, FLAC, etc. M4VConverter Plus will help you watch any video format you want! As a powerful iTunes DRM Media converter, M4VConverter Plus can convert iTunes DRM Media in high speed and great quality. With M4V to MP4 Converter, you will never be disappointed. The following are the powerful functions of the iTunes DRM Media Converter for Mac. 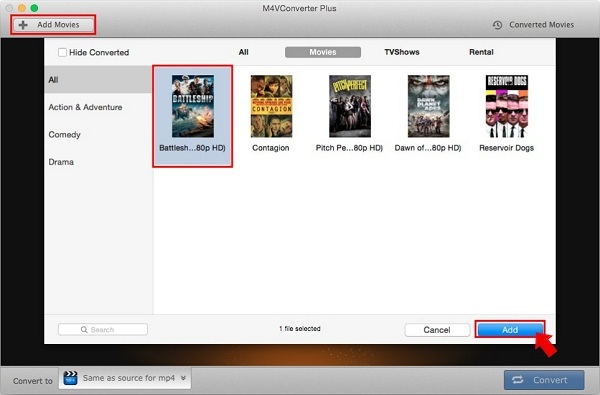 No matter what videos are purchased and rented, M4VConverter Plus can convert them. M4VConverter Plus can show the iTunes DRM Media with clear classifications like Movies, TV Shows, Rental according to the iTunes library. You can import iTunes Media quickly by clicking the Add Movies button. iTunes Media always have different solutions with SD or HD. M4VConverter Plus can even support the 1080pHD videos and can convert it with high quality output. M4VConverter Plus can help you legally bypass digital copyright protection from DRM protected videos purchased or rented from iTunes Store. Whatever player you have, you can find the right output format for it. M4VConverter Plus supports diverse formats suitable all kinds of players like iPhone, iPad, PSP, PS3, Apple TV, Zune,Samsung Galaxy S, Google Nexus, Creative Zen and so on. If you just want the audio from iTunes Media, you can select the popular audio formats like MP3, AAC, AMR, FLAC, etc. iTunes Media always have a long time and contain chapters. The chapters can help you find easily which chapters you have viewed. You just set the beginning and ending time to clip the video. It is so easy to get the segment you want. Multiple audio tracks give you more selections to enjoy the video or choose what your preferred to make the conversion more quick. When you want to add a new audio to video, M4VConvert Plus can help remove the audio from the video instead of muting the audio. iTunes media always have a big size, especially 1080pHD movies. It is very efficient to convert media with 30x faster conversion speed. According to the upper functions, M4VConverter Plus is a completely wonderful iTunes DRM Media converter to meet all your needs. After conversion, you can check on your output in the history list. And you can even set the operations to open the output folder or shut down your Mac. The intuitive interface is really easy to operate.